We finally managed to fit in a long awaited trip to Welney Wetland centre on Friday. I wanted to see the migrant swans on their last day of official feeding, which means very soon they'll all be heading off for their summer breeding grounds! Thousands of Whooper and Bewick's swans, not to mention thousands of male Pochards too (the females over winter in Spain - clever girls!) all gather at Welney from October through to March. An amazing sight, especially when you spot them, as we did a couple of weeks ago, in a farmer's field a few miles away, where they go to feast on waste sugar beet tops in between their 3 feeds a day at Welney! So had to include a few pics on the album this week! Though they're not very good ones as they were taken through glass, just as feeding time was about to commence! 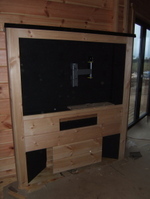 As you can see, the TV unit (or Punch and Judy theatre, depending on who's reading this!) is nearing completion. All we need now is the TV!!! The pigeon ( or in our case geese) spikes have been erected on the beam above the 1st floor balcony to try and curb the geese perching, and subsequently fouling, the decking below!! Oh, the joys of the countryside! The photos show all!! The one remaining bird nesting box was found to have a roof leak, so remedial repairs have been carried out (see pics) and next week I'll take a pic of it hung in-situ in one of the garden trees. I'd love to know what the local bird population is making of this sudden glut of homes to rent!!! Mind you at the rate we're going we may well find ourselves renting one too!!! We've been looking at the weblog periodically - it's all looking really great!